A number of brokerages downgraded the earnings estimates for India after the September quarter results. However, a global comparison shows India Inc is still doing better than major emerging market peers and some developed nations, too. A Business Standard analysis of Bloomberg data on earnings downgrades over the past four weeks shows a cut in estimates for all the four members of the Bric nation-bloc for next year - Brazil, Russia, India and China. Analysts have downgraded earnings estimates for Indian companies by 0.43 per cent. Chinese markets have seen a downgrade of 1.93 per cent. Brazil's estimates are down 8.53 per cent. Analysts have downgraded Russia's earnings estimates by a little over 18 per cent. Rajat Rajgarhia, managing director, institutional equities, Motilal Oswal Securities, said India was better placed than commodity producers in the light of recent corrections. "India has commodity users and has the advantage of domestic demand," he said. However, earnings are likely to see some pressure, although they might be better than in most other countries. "We have a well-diversified corporate base, unlike some of the other emerging market peers which are over-dependent on commodity exports. The second aspect is that the overall economic growth is decent, and we are relatively insulated because of our domestic demand scenario, compared to some of the other countries," said Rajeev Thakkar, chief investment officer at PPFAS Mutual Fund. Thakkar runs an equity scheme which invests both in India and abroad. It currently has a 65-per cent exposure to Indian equities, and 25 per cent to foreign companies. It can invest up to 35 per cent in foreign equities. A few developed nations are also faring worse than India. Mavens have downgraded their estimate for the United Kingdom by 1.86 per cent. Canada's estimates are down 6.49 per cent. 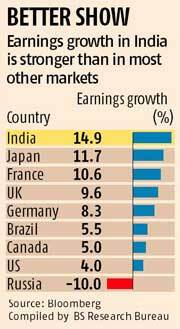 Other countries doing better than India include France, where earnings were downgraded only 0.27 per cent. Others have seen upgrades. This includes the United States of America( +0.37 per cent), Germany (+1.05 per cent) and Japan (+2.42 per cent). Earnings growth is also expected to be among the highest amongst its peers, according to a Credit Suisse India Market Strategy report dated December 8. "By consensus estimates, the Indian market is likely to see the strongest earnings growth among major economies… And, while we expect consensus earnings estimates for India to be revised down, the downward revisions are also among the least severe in India," said the report, authored by analysts Neelkanth Mishra and Ravi Shankar. 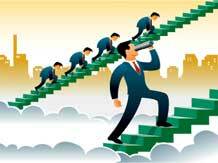 India's earnings are expected to grow 14 per cent next year. China's is three per cent, Brazil five per cent and Russia is expected to see a fall of up to 15 per cent. Prakash Kacholia, managing director at Emkay Global Financial Services, said on-ground pick-up in earnings was at least a couple of quarters away. "It will take at least six months for the industry to see some uptick, although we are better placed than the world." he said.